Still busy with the crochet. Still loving it too. Though I have to admit to some ripping as well as rippling!! After a long visit to Ravelry, (Have you ever tried getting in and out of that place quickly?) 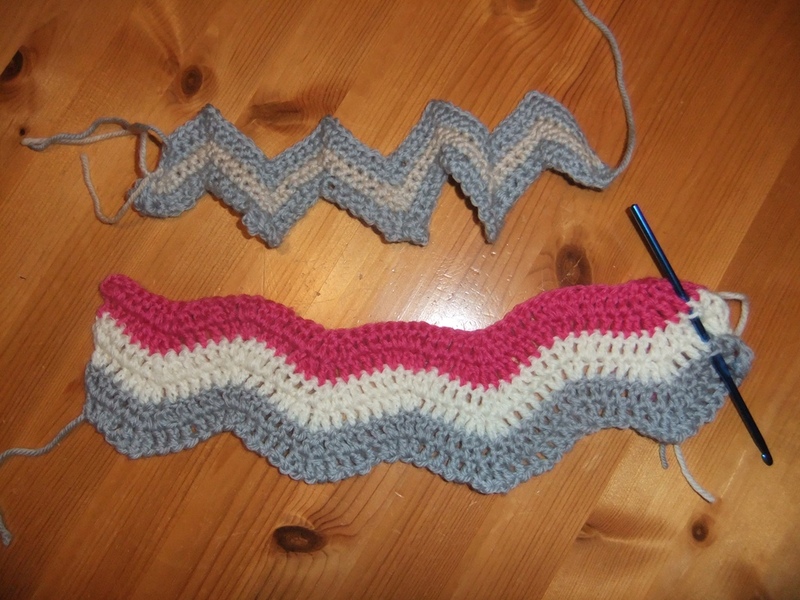 I had a go at a nice looking pattern, it was more like peaks and valleys than ripples. (The top one of my two samples). I really wasn't happy with it, so back to Ravelry I went and came up with a link to the second one. No rippling today though. I plan to spend the day with my sewing machine. Last Friday, yes a whole week ago!! I spent an age digging through my scraps box. Which really is a scrap box, no system of nicely cut squares and strips here, just a box of left overs all thrown in! So after a good rummage I had a pile of likely looking fabrics, which I pressed and cut. Now I have a pile of six inch strips and some foundation fabrics. The plan for today is to sew, sew, sew. But first I have to master the needle threader on my shiny new Janome, cause I can't see the damn hole!! Works in planning and progress. The Damage. Don't look if you're squeamish! !